Hate balance? Get irritated waiting around for something to happen? Prefer to live in a world of extremes? Temperance is about to rain on your parade of crazy. 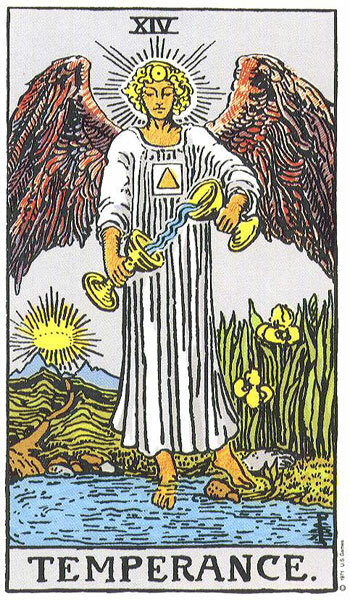 Temperance is a Major Arcana card, featuring a single being (usually appearing to be angelic) pouring the contents of one cup into another. The figure is also sometimes pictured with one foot on land, one in the water, once again denoting the need to blend realities, or balance them out. 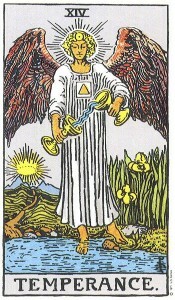 Temperance is neither positive nor negative, but it does counsel patience. Things will change, but only in due course, and rushing headlong into your future isn’t your wisest course now. Better to meditate on how you can make your current situation work for you, linking your conscious world with the unconscious for best effect. Intriguingly, in some decks, this card is referred to as The Alchemist–pointing to the ability to transform one situation into another…usually by finding elements of your current reality that you can patiently mix to create the new reality. 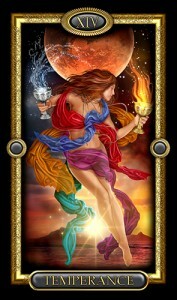 In a reading, this card indicates patience, the careful mixing of disparate elements, balance and harmony. Just as the liquid flows between the cups held by the angelic figure–you are Flow. Extremes are no longer necessary because you are One with All that Is.